China’s export economy grew 12.2% in July despite Trump’s levying tariffs on Chinese goods earlier this month. Chinese imports also grew despite retaliatory tariffs on the US. Trump imposed tariffs on $US34 billion worth of Chinese goods on July 6, and is expected to tax $US16 billion more later this month. China’s export market grew by 12.2% in July after Donald Trump slapped billions of dollars worth of tariffs on the country earlier that month. The Trump administration instigated the tax on $US34 billion worth of Chinese goods last month, citing “unfair trade practices,” and is set to announce a second tranche of tariffs on $US16 billion worth of products later this month. 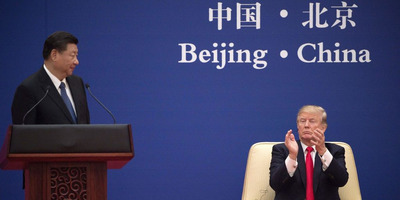 But despite Trump’s trade war, Beijing exported $US215.5 billion in July, constituting a 12.2% rise on June’s figures. The reasoning behind the rise in Chinese exports is not clear. The yuan weakened dramatically in late June, which likely made exports cheaper. The figures run counter to Trump’s earlier claims that China was “doing poorly against us,” and that US tariffs had been “really hurting” China’s economy. Shortly after Trump announced his tariffs on China, Beijing also retaliated with $US34 billion worth of tariffs of their own on American products. But despite this, imports into China also grew by 27.3% in July, totalling $US187.5 billion. This was likely due to robust demand within China for foreign products, Reuters reported. NICOLAS ASFOURI/AFP/Getty ImagesTrump and Xi in November 2017.